SALT LAKE CITY – Today, Attorney General Sean Reyes, in partnership with the Governor’s Office, presented a gubernatorial declaration recognizing January as National Slavery and Human Trafficking Prevention Month and awarded several groups, including visiting Haitian dignitaries, that are working to combat human trafficking locally and globally. The Declaration for National Slavery and Human Trafficking designates January in Utah as the month to remember victims and commend all groups, individuals, and public servants for their diligent efforts to educate themselves, inspire others, rebuild lives, and to protect the inherent worth of each citizen and human being. Notable among those honored was Haiti’s Attorney General, Clame Ocnam Dameus, his Chief of Staff, Jim Petiote, as well as their wives and several staff members, for their work combatting human trafficking in their home country. AG Ocnam and his team are visiting Utah due to their partnership with AG Reyes and Operation Underground Railroad to discuss efforts abroad. In addition, the following eight groups were given special commendation for their efforts to combat human trafficking within the State of Utah. AG Reyes has been a leader and an international voice in the fight against human trafficking and continues to lead Utahns to aggressively fight through education campaigns, support of anti-human trafficking legislations, victim recovery and advocacy. 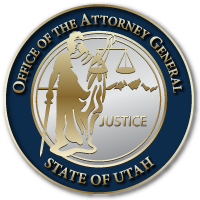 This is accomplished through grassroots and NGO efforts, partnerships with local law enforcement officers and agencies, as well as work initiated by the AG Office through the Utah Trafficking in Persons (UTIP) Task Force and prosecutors of the Utah SECURE Strike Force. Read a copy of the Declaration here: Utah Declaration on National Slavery & Human Trafficking Prevention Month. This entry was posted in Recent Posts and last updated on January 9, 2018 .